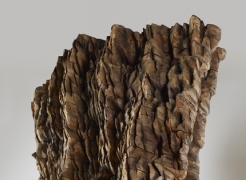 In her sixth solo exhibition at Galerie Lelong, Ursula von Rydingsvard will present three new monumental works that exemplify the artist as a sculptor in full command of her craft, further developing the vocabulary that she has so thoroughly honed: abstract, architectural forms composed of accretions of wood. Each of the three works—Droga, Unraveling, and Blackened Word—is tightly composed around a structured center and unfurls into a more complex, expansive configuration. ERRĀTUS, “wandering” or “roaming” in Latin—will open to the public on March 18 from 6 to 8 pm, and the artist will be present. One of von Rydingsvard’s recurrent themes is the juxtaposition of organic and structural forms, transforming massive undertakings of carving and building with dense materials into elegant figures expressive of movement and gesture. Roughly cut pieces of cedar are joined and form an intricate, sensual surface. von Rydingsvard’s figures often allude to everyday objects found in the home, such as a bowl, bonnet, or staircase—simple, universal pieces that are deeply imbued with humanity. For ERRĀTUS, von Rydingsvard has created three epic works in cedar, each remarkable in its vast scale and vision. Droga rises up from the floor, unfolding into rhythmic waves. Under von Rydingsvard’s hand, the cedar feels fluid, like fabric. In Blackened Word, slight tracings serve as the foundation for a nearly seven-foot tall freestanding structure—the tentative handwriting of an elderly woman was laid on the floor, from which von Rydingsvard built upward to create a towering, undulating wall. The third work in the exhibition, Unraveling, is an elaborate, overwhelming wall “drawing” in cedar. The largest and most complex among von Rydingsvard’s works hung on the wall, Unraveling features cup-like shapes that protrude and extend downward, forming a giant’s drapery. In ERRĀTUS, von Rydingsvard displays her natural agility in drawing the intimacy, grace, and emotion out of the most primal of elements. Concurrent with ERRĀTUS is the installation of a new work at Storm King Art Center in Mountainville, New York, commissioned for the sculpture park’s 50th anniversary in April. Also opening in April is the new addition to the North Carolina Museum of Art, at which another outdoor commission by von Rydingsvard, entitled Ogromna, will be unveiled. In 2011, the Sculpture Center, New York, will present a major retrospective of von Rydingsvard’s work. The exhibition will later travel to the deCordova Museum and Sculpture Park, Lincoln, Massachusetts; in 2008, the deCordova presented von Rydingsvard with its renowned Rappaport Prize. von Rydingsvard’s works can be seen in over 30 public collections, including the Museum of Modern Art, New York; Metropolitan Museum of Art, New York; Whitney Museum of American Art, New York; High Museum of Art, Atlanta; Walker Art Center, Minneapolis; Nelson-Atkins Museum of Art, Kansas City; Storm King Art Center, Mountainville, New York; and Kemper Museum of Contemporary Art, Kansas City.